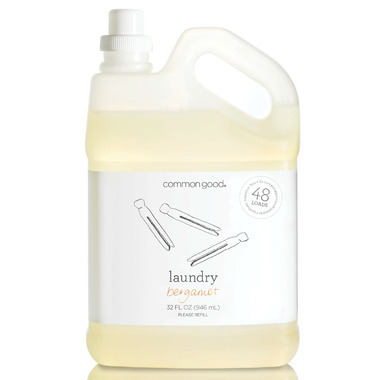 Common Good Bergamot Laundry Detergent is a safe, green, hard-working detergent in a bottle you can refill. Iâ€™ve been using this for awhile and I canâ€™t go back to anything else. The smell is very light and refreshing and cleans clothes really well. I think anything non toxic is worth every dime. Cleans my clothes, smells great, and biodegradable is a plus. I'm only confused about the claim that the bottle is refillable. Is there a way I can send my bottle back to the company to get it refilled or does Well have a system? Or are they merely noting that I can refill a plastic bottle? Expensive, but the scent is just beautiful and subtle. The only one I can get away with that the husband does not complain about! To be honest, I have never been that big on scented laundry before myself, but again, this is lovely. Pros - Scent is mild, lovely and not offensive at all. Cleans really effectively. Cons - It's expensive and won't last me long since I have a top loading machine but I'm still very happy with my purchase because of the quality. I really like this laundry soap. A nice light scent and seems to get my clothes clean. I have a 7 month old and 3 year old. So I do get some dirty clothes. Amazing! Works so good at cleaning, but leaves a very subtle, fresh scent. Excited to try the lavender scent next!